The fallen activist Milo Yiannopoulos was over US$2 million in debt during 2018, documents have revealed. The cache of damning files was released by Australian Events Management (AEM) and indicate Yiannopoulos owes US$1.6 million to his company — Milo Inc. — US$400,000 to the billionaire Mercer family — his former sponsors — US$153,215 to his former legal team, US$52,016.64 to the Four Seasons in Hualalai, Hawaii where he married in 2017, and US$20,000 to Cartier, among other sizeable liabilities. AEM is a tour promotion firm run by brothers Ben and Dan Spiller, which repeatedly attempted to secure Yiannopoulos speaking tours of Australia — but all eventually failed. In the last attempt, he was scheduled to speak with a variety of high-profile, controversial figures, including Ann Coulter, Tommy Robinson, Roger Stone, Gavin McInnes — founder of the now proscribed Proud Boys group — and Australian senator Fraser Anning, who once called for a "final solution to immigration in Australia". The three failed tours AEM promoted — in April, September and December — fell through due to various factors, including scheduling conflicts and the inability of some speakers to secure Australian visas. The Spillers were heavily criticised for not offering refunds on sold tickets, but claim they themselves are out of pocket as a result of their entanglement with 'Milo Inc.'. ​The documents starkly detail how the relationship between the brothers and Yiannopoulos went sour, with the latter constantly demanding funds from the promoters for living expenses, medical bills for himself and his husband, and wages for his employees, on top of sums the promoters already transferred to him in advance of the shows. In one email, he says he's "less financially secure, more panicked and stressed, and more miserable than when we started", and admits he was forced to return his wedding ring to Cartier to wipe out his debts with the luxury jewellery brand. Nonetheless, Yiannopoulos also speaks of a desire to move to Australia, stating the political environment in the US is "insane" — as a result, "pulling off" the tour "well" was said to "really matter" to him, especially as he acknowledges a failed tour would damage his commercial potential in the land down under. ​Since their bust up, Yiannopoulos has published the Spillers' assorted contact details in various social media posts, which the brothers claim has led to a deluge of threats from the former star anti-feminist's supporters. ​He also told The Guardian the documents referred only to "company" not personal debts, and he was "doing fine" financially, "bringing in US$40,000 monthly. He also called the Spillers "crooks and clowns" in response to the duo commencing legal action for the "return of funds" from Yiannopoulos. Whatever the truth of the matter, it may be irrelevant whether the documents refer to company debts or not — for in the case of his US$153,215 liability to his legal representatives at least, the firm makes clear Yiannopoulos is personally responsible for the debt. The debt arose after Yiannopoulos attempted to sue publisher Simon & Schuster for US$10 million after the publisher cancelled their US$255,000 book deal in the wake of a recording coming to light in which the aspiring author seemingly endorsed sexual relations between men and underage boys. 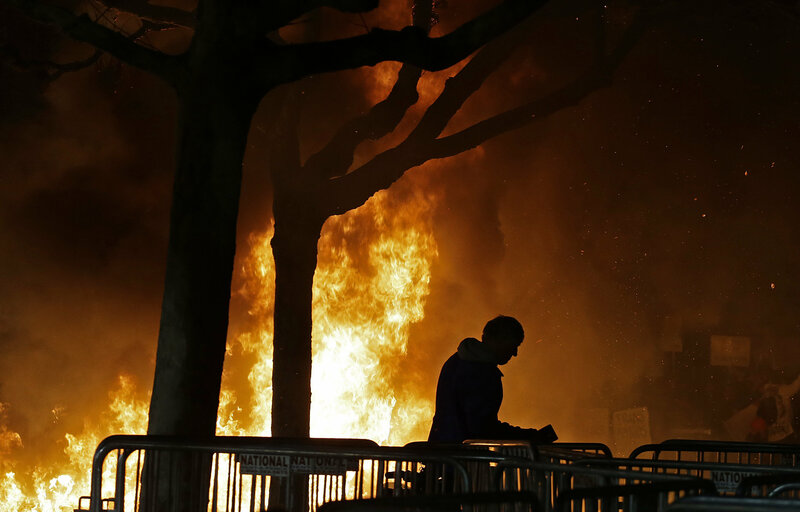 A bonfire set by demonstrators protesting a scheduled speaking appearance by Breitbart News editor Milo Yiannopoulos burns on Sproul Plaza on the University of California at Berkeley campus on Wednesday, Feb. 1, 2017, in Berkeley, Calif. The ensuing lawsuit was extremely expensive and ultimately failed. However, over the course of the action, a manuscript of the proposed book — autobiography ‘Dangerous' — was released by Simon & Schuster replete with editor's notes, exposing the company's extreme misgivings about the book's content. The editor's overall take on the book was "at best a superficial work full of incendiary jokes with no coherent or sophisticated analysis of political issues", with "points lost in a sea of self-aggrandizement and scattershot thinking", and "juvenile, egotistical boasting" throughout. The manuscript proper is littered with evidently exasperated and unimpressed comments, at times chastising Yiannopoulos for making sexist and racist jokes, employing bigoted terms, and comparing various figures and groups to the Nazis. One observation states "unclear, unfunny, delete" — when Yiannopoulos calls for lesbians to be banned from academia, the editor is reduced to simply stating "DELETE UGH" in shouty capitals. ​'Dangerous' was eventually self-published in July 2017 — while the author claims to have made millions from sales, data revealed it sold fewer than 20,000 copies in the weeks after release.